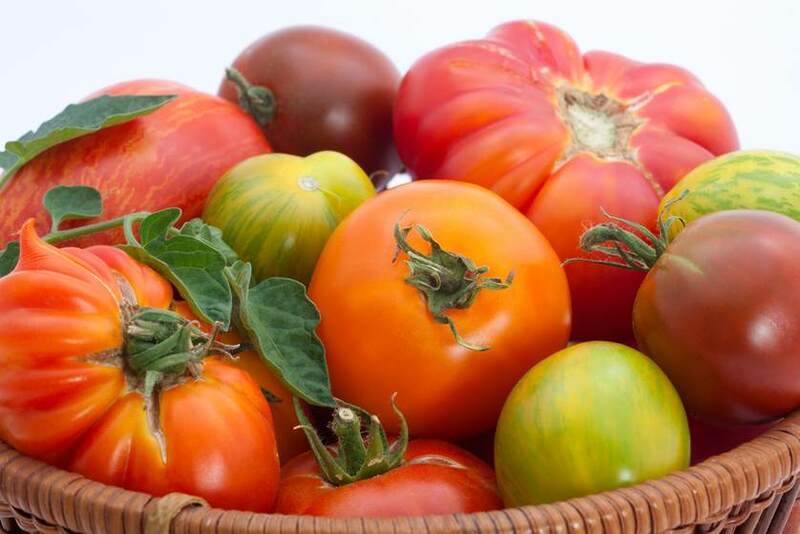 Since everyone’s interested in tomatoes and there as sooo many different varieties, I’m going to help you all (and myself) out and review the tomatoes that I grew this year. 2011 was not ideal tomato weather. We started with daily rain, then in late June/July, went several weeks without any noticeable precipitation, then it rained quite a bit again starting in August and it continues to be very wet (I think we’re something like twenty inches above normal for the year). Temperatures also fluctuated wildly, with a good solid week of mid- and upper-90s mixed in with some seasonally cool weather. I was actually reading an article the other day in the local paper about how the weather this summer affected the flavor of tomatoes (negatively). Pretty interesting. But anyway, I’ll do the best with what I have. I’m starting with the small tomatoes today. 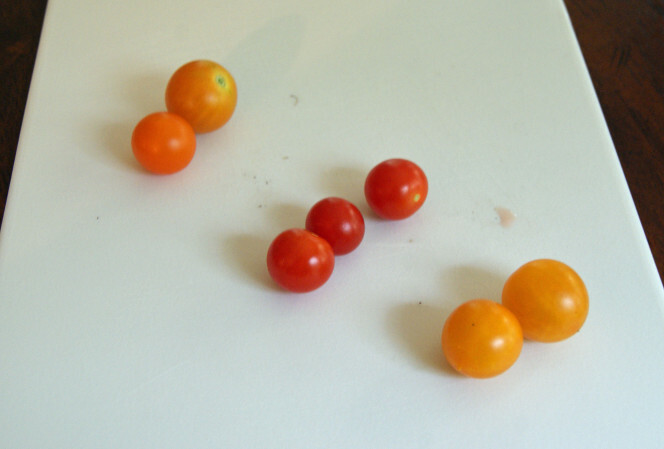 Blondkopfchen – average-sized cherry tomato, yellow-orange color. Good tomato flavor, sweet, and had the largest clusters (dozens) of any of the cherry tomatoes. Did split some with all the late-season rain. 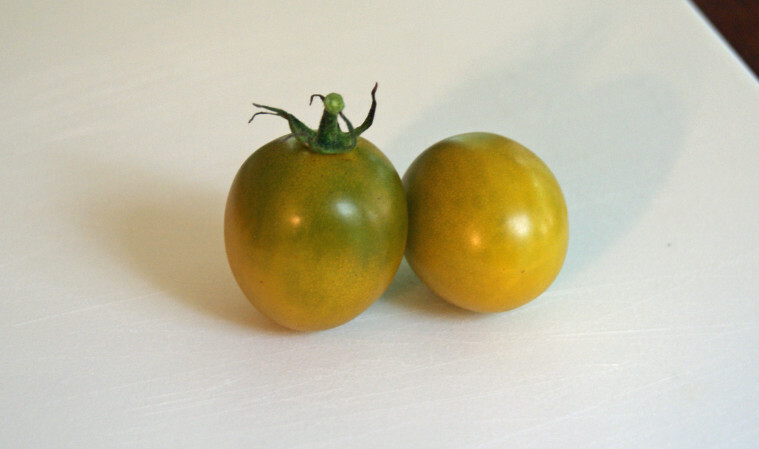 Sungold – this lived up to its sweet billing, definitely the sweetest of the bunch; orange color, a little darker than Blondkopfchen. It was also the first to ripen and produced lots of clusters of about 8-10 fruits. Also prone to splitting. Mexico Midget – smallest tomato I grew, closer to marble-size. Good flavor, red color, good production; one of the worst for splitting. Green Grape – these were bigger than I expected, more like small plum tomatoes. Green-yellow in color, flavor was typical of green tomatoes – a little tangier than red, not quite as sweet. Some splitting; low production – I only got maybe a couple dozen off of two plants, so whether it was the weather or not, I may look for a different green cherry variety next year. Overall production wasn’t too bad, as the smaller tomatoes usually have more margin for error, and produce pretty well regardless. I’d do three of the four again, and I’m still up in the air with the Green Grape. Splitting was an issue this year for everything, but it does hit the smaller ones harder.